If you’re considering investing in visitor management software, congratulations! New technology has the power to give your administrative staff hours of their time back, make a great impression on visitors, and boost security and safety by keeping better track of who comes on site. However, there are a growing number of options for these check-in programs. Your staff should spend time vetting each program to understand the advantages and drawbacks of each option. Choosing the wrong program for your business results in paying for features you don’t need, or choosing a program that doesn’t deliver the best value. It can also waste plenty of time if you have to make a change later. If you’re vetting programs now, here are six questions to ask before you make a final selection. Is it easy for people of all skill levels to use? The best visitor management systems are clear and user-friendly, and not just for the visitors. Although many companies first get interested in visitor management software purely for its polished client-facing features, it takes a lot of work on the backend to create check-in processes and reports that work best for each organization’s unique needs. Look for a program that has features like drag-and-drop interfaces, wizards, and robust customer support that can respond to questions quickly. Even better, look for a program that allows staff to try it out and assess how easy it is to use before you make a long-term commitment. Does it streamline the entire visitor management process? Some visitor management systems specialize solely in checking visitors in, leaving the other work (such as printing visitor badges, playing safety videos, or alerting hosts that their visitors have arrived) to the front desk staff. The best systems are fully automated and can even work perfectly well when a human receptionist is unavailable. The Receptionist, for example, allows visitors to chat directly with their hosts via the check-in tablet. That means that visitors can wait in the lobby with full confidence that their host knows they’ve arrived, and it also reduces the odds that they’ll simply wander into the office unannounced. Look for helpful features that make checking in even easier for your guests. Some visitor management programs have “returning visitor” features that allow visitors to store their information and check in more quickly on their next visit. Some allow hosts to pre-register visitors before their first visit so that they can simply review their personal information instead of entering it all manually. Your staff should also be able to completely customize the check-in fields and screens to suit your office’s needs. Can it produce helpful reports? Investing in visitor software is often the best first step to really getting proactive about visitors’ experiences in your office, and in getting your front desk to run as efficiently as possible. With the right reports, you can get insights into who is visiting your facility, for what reasons, and when they tend to arrive. This data can then help you prepare with staffing and other resources so you can plan appropriately. Some visitor management systems will also give insights into how visitors are interacting with the system, such as how long it typically takes them to check in and which pages they spend the most time on. These insights can help your staff continue to improve the check-in process. Can it grow along with my company or organization? No one likes to start over with a completely new software once they’ve already settled into using one. But this is the only option when a company’s needs outgrow the capacity of a given visitor management system. The best visitor management software can expand to meet needs caused by growing visitor traffic, changing facility layouts, and even additional company locations. 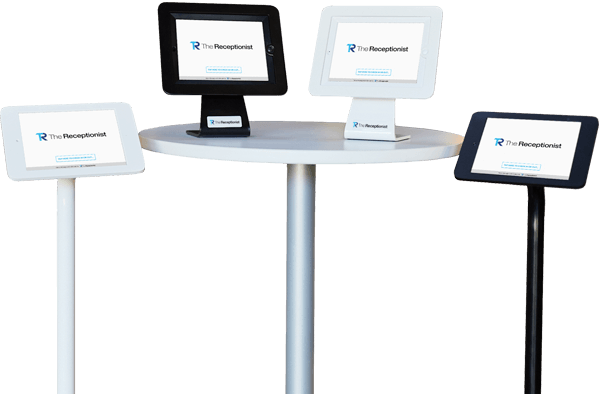 Tablet-based systems like The Receptionist, which run on cloud-based software, are ideal for managing multiple entrances and adjusting for surges in visitor traffic, because adding a check-in station (and doubling check-in capacity) is as simple as investing in one more iPad and stand. The Receptionist also has a locations manager feature that allows administrators to add new locations quickly, see all locations at a glance, and even tailor branding and check-in procedures to the needs of each location. The Receptionist also has a multi-language display option that allows visitors to select which language they want to use. Administrators can add new language options at any time. How does it store legal signatures? For many organizations, collecting legal agreements is one of the most important parts of the visitor check-in process. From safety, security, privacy, non-disclosure, or other visitor behavior, failing to educate your visitors and collect a record of their agreement could compromise safety, security of visitors and employees, and financial security of your business. If visitors aren’t informed of the potential risks and best safety practices, they could put themselves and your employees at risk. The best visitor management systems will enable visitors to sign legal agreements seamlessly as part of the check-in process, and also keep a timestamped record of the agreements in case they’re needed for legal or compliance purposes. The Receptionist, for example, collects these agreements completely paperlessly. Visitors can sign agreements using their finger on the sign-in tablet, and the agreement is stored in the system for administrative use. Does it protect client privacy? Visitor privacy is important. Digital visitor check-in systems are a big privacy upgrade from paper logs, which leave visitor information visible to all. However, many systems take privacy measures a step further by allowing visitors and administrators to specify whether and how long visitors’ personal data should be stored. Visitors to your office might not want a permanent record of when they visited your company. This is especially important for industries like clinics, therapists, and legal offices. However, all businesses should be taking an increasing interest in privacy protection, especially in light of laws such as the EU’s General Data Privacy Regulation. (Related post: How the GDPR Will Affect Your Visitor Check-In Process). One specific feature to look for is the ability for software to automatically remove visitor data at custom intervals, such as at the end of each day, week, or month. Finally, if you’re looking for a user-friendly visitor management program that will handle your entire visitor management process, has a robust reporting system, can grow with your company, collects legal signatures, and values visitor privacy, we invite you to try The Receptionist visitor management system. The Receptionist offers a free, custom, no-obligation demo as well as a completely free 14-day trial where you can check out all of the features. Click here to try it today. Take these steps before comparing software features. Subscribe to receive this extra checklist.